Comments Off on Bruins get Mauled in Lakefield! Bruins get Mauled in Lakefield! The Bruins came out flat in Lakefield tonight and were down 2-0 after one period of play. The Chiefs opened up a 5-0 lead in the second before Conner Beck found the back of the Chiefs net, however that lead became 9-2 as Keegan McCarthy got the final Bruins goal of the night. Two more in the third gave the Lakefield club an 11-2 win over Uxbridge. Comments Off on Bruins Ice a 4-1 Win at the Bear Den! Bruins Ice a 4-1 Win at the Bear Den! The Uxbridge Bruins got things rolling in the first period on Tim Bierema’s goal as Carter Vahey’s pass hit the skate of an Ice player and deflected to him and he one timed the puck into the open side. Korey Brand picked up an assist enroute to a 3 point night. Brand made it 2-0 on Marco Mastrangelo’s pass into the slot as he redirected the puck into the net. Bruins tender Max Tjin made several key saves early and with the help of the crossbar he turned aside all shots he faced through both periods including a breakaway save of off the Ice’s Brett Theissen in the second. Brand scored again in the second short handed as he threw the puck at the net and an Ice player accidentally cleared it towards his own net. Mastrangelo assisted on the play. After the ice made it 3-1 the Bruins came right back and Bierema (PP) fired a wrist shot over the glove of the Ice’s goalie with assist going to Conner Beck and Mastrangelo for a 4-1 final. Comments Off on Merchants walk away with Shootout win over the Bruins! Merchants walk away with Shootout win over the Bruins! 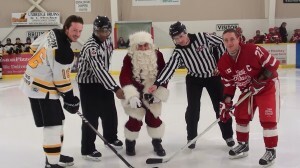 Santa is joined by the Bruins Matt Allen and the Merchants Cash Cormier for the official puck drop Friday night. Also assisting Santa is Linesmen’s Shandor Alphonso and Scott Walker. Little Britain’s Terry Snoddon was the sole shootout goal scorer in a 3-2 win over the Bruins tonight. The Bruins led 1-0 on Tim Bierema’s first period goal and then had to battle back to tie it at 2-2 on Bierema’s second goal of the night. Corey Brand had two assists while Marco Mastrangelo and Carter Vahey each had one a piece. Max Tjin came up with several key saves in the Bruins net despite taking the loss. Comments Off on Bruins with the Flames and Hawks players at tonight’s game! Bruins with the Flames and Hawks players at tonight’s game! All of The Bruins players came out to take a Photo Op with the Flames and Hawks players after their Timbits game. The prenovice teams played a 7 min game during the first intermission. Comments Off on Bruins Welcome Conner Miller to their Line-up! Bruins Welcome Conner Miller to their Line-up! 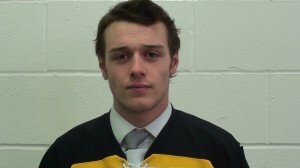 Coach Geoff Hodgkinson announced that forward Conner Miller, a native of Stouffville On was signed by the Uxbridge Bruins on Wed Dec. 18th. Conner played this season with the Stouffville Spirit of the OJHL where he had 2 goals and 2 assists in 25 games and is a graduate of the Midget AAA Markham Waxers organization where he played in 2011/12 and 2012/13. The Bruins organisation welcomes Conner to the team! Comments Off on Mojacks Shutout the Bruins in Rematch! Mojacks Shutout the Bruins in Rematch! Drew Siydock picked up the shut-out as Port Perry prevailed 3-0 over Uxbridge in the second game between these two teams this weekend. Cody Northover was tagged with the lost for the Bruins. Comments Off on Bruins Volunteer! 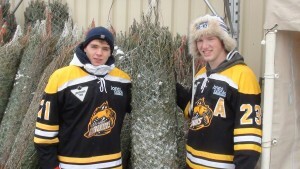 Keegan McCarthy and Tim Bierema volunteer their time on a cold Saturday assisting customers at the Optimist tree lot at Canadian Tire Uxbridge. Comments Off on Bruins double up on the Mojacks! Bruins double up on the Mojacks! 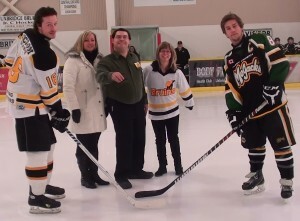 North Durham drop the Official Puck at the Bruins / Mojacks game. The first period was a tight affair as only Marco Mastrangelo could find the back of the net as he fought off a Port Perry defender and slid a hard wrist shot along the ice for a 1-0 Bruins lead. Korey Brand assisted on the play. Then in the second Captain Matt Allen banged home the puck in a goalmouth scramble to give the Bruins a 2-0 lead. Mastrangelo and Brand picked up assists. on a similar play Liam Blais fired top shelf as the Bruins opened up a 3-0 score chasing the Mojacks starter Jeff Julien from the net. Justin Dube and Carter Vahey started the play. The Mojacks got one back to trail 3-1 after two periods of play. Cody Northover made a spectacular save from 5 feet in front while playing with his defenceman’s stick. Brand picked up his 3rd point of the night making it 4-1 Uxbridge from Mastrangelo and the Mojacks added a late goal for a 4-2 final for the Bruins. Comments Off on Eagles Sweep the Bruins! Justin Dube opened the scoring for the Bruins but the Clarington Eagles came back to take a 2-1 lead, holding onto a 3-2 final to take both games of the weekend series. 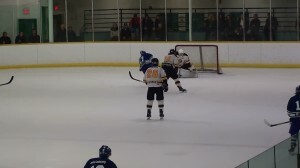 Marco Mastrangelo scored the Bruins second goal of the game. Cody Northover made 40 saves in the Bruins net. Comments Off on Bruins Lose first game of home and home with Clarington! Bruins Lose first game of home and home with Clarington! (In Photo) Members of the UYHA prenovice Bruins and the Stars played an intermission game before a large Bruins Crowd Friday night. Dylan Locke’s redirection on Carter Vahey’s point shot was the only goal the Bruins would get, in a 4-1 loss to Clarington. Conner Beck also picked up an assist. Max Tjin took the loss in goal for the Bruins. The two teams play a rematch on Sunday in Clarington.